Jack Stand Safety. Please Read! On 2 different forums I am on, there has been failure of jack stands. One of them escaped injuries by miliseconds and the other unfortunately was crushed to death by his truck. I don't want to post specifics, but you can find many instances on the web. Please inspect the welds and also the cast parts for cracks. Have a safety net such as a jack supporting the vehicle or even slide the wheels under the car to keep it from totally crushing you. NEVER get under the car with a jack only! When I get home, I'm going to make a set similar to these below. They're bulky, but can't fail. Re: Jack Stand Safety. Please Read! The type of jackstand pictured is usually high-quality equipment that should support 4 tons. I'm absolutely stunned to see it fail. I use similar but bigger stands daily at work. Eaglefreek has given me pause. Eaglefreek's blocks are fail-proof. Also safe is equipment that is marked as OSHA-compliant. Good equipment should come with instructions on its proper use. It's expensive but worth it. I sincerely wish never to hear of this sort of incident on this forum. Great, now even the equipment designed to support a car can't be trusted??!! Scarey stuff. You think you're doing everything right too. I hate it for whoever this has happened to and my heart goes to the family of anyone who died from this. Thanks for the heads-up. I never would had thought this could happen; just never crossed my mind. Thankfully I won't have this problem with my Eagle. Any time I get under mine I have jack stands under all 4 wheels and a 2 ton jack under either differential. One failure would look bad but at least I would have a much better chance of not being crushed. Finally found a use for all those 2x4 scraps I have lying around!! Thanks for the idea!! Keep in mind that one failure can cause a cascading effect. If one breaks, the tipping can and often will cause others to fail. Sudden wind gusts will push cars off stands too. Another thing no-one seems to account for is ground movement. Be it soft ground or a Geo movement (earthquake). I was the near fatal victim of the latter. Jan '95 the Duvall quake hit here and I was under a friend's '91 Honda Civic when the floor went sideways, shooting the axle stands out. I also had the jack under there and blocks under the wheels, which is what likely saved my life. I was too far under to get out when I saw the car going over. It bounced off the blocks, shooting them out then it came down on my head. I tried to grab ahold of something to stop the car (back in the late '70s I trained to be an Olympic weight lifter) but nothing was there solid enough. I felt the crunch when it hit. The drain plug of the oil pan I had just tightened hit my head near the temple, punching a hole in the bone but it didn't break the skin and it caused a basal skull fracture from the occipital opening (eye socket) across the top of my skull, forcing my eye out of the socket. I finally found something solid (I think it was the axles) and the adrenaline effect allowed me to bench press the car and throw it backwards, through the wood garage door as my friend came running because he heard my scream. I kicked the wall so hard that I crushed the sheetrock against the concrete behind it and left a permanent imprint of my boots. Mr friend freaked when he saw me with my right eye hanging out and blood coming out of my left ear (I had a tear in the lining of the ear canal and later found out the anvil and stirrup were torn apart) I was going to drive myself to the hospital, but my friend's family kept me from doing that and called an ambulance. The Dr in the emergency room cleaned my eye and popped it back in the hole and then they did a Cat scan to see how bad it was. They kept me in there overnight in the trauma ward. I overheard a couple nurses say "poor guy. He's not going to make it" but I'm not sure if it was me they were talking about. I stayed awake until the next day when the Dr came to check on me and I said "I'm still here!" so they took me to a regular room and I slept finally. I survived. 95% of people in this situation don't. Play it safe. Not everyone can be in the 5% that make it. If the handle of the jack is up, the weight of the handle can lift a vehicle enough to tip it off the stands and people walking by can trip over the handle and knock the works down on you. Been there, done that. If one looks at the four ton jack in the first picture you can see where it had been cracked for some time then finally broke. 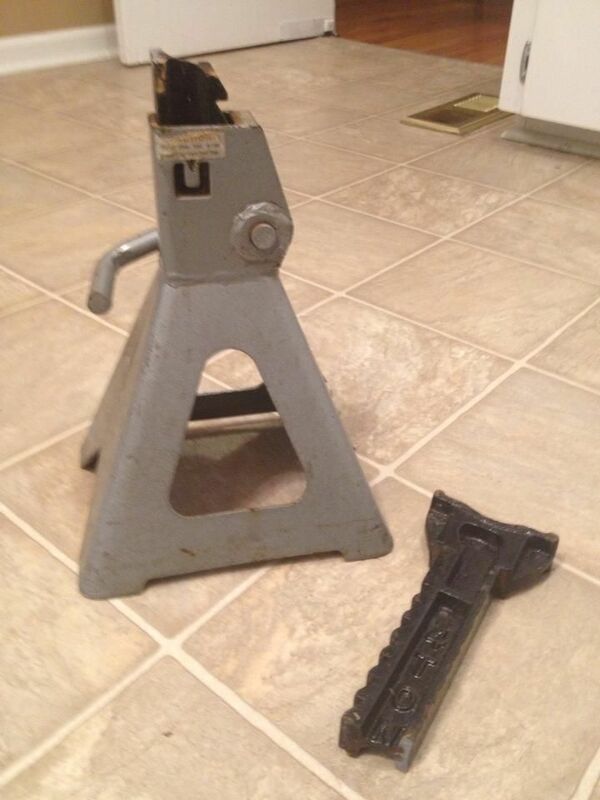 I have used this type of jack stand for many a year but truly never quite trusted them. Now I know why! I usually used my floor jack as a back up but even so I was always happy to get out from under the car. One of my best friends was crushed to death when a jack broke on him. I believe I will build me a set of those 2x4 jack stands posted by eaglefreak. They look much safer then anything I've seen. Thanks for posting and sharing with us and prayers to the families of those lost or injured by these accidents. Holy cow, Carnuck, that's a horrible story. I'm glad you survived. I'm glad you survived too. Incredible story. Carnuck, that's some story of survival. I can't imagine being trapped under a car, and I certainly don't have the strength to bench-press it off of me. As would any mechanic I have a collection of horror stories involving vehicles falling off jacks. I won't tell them as Carnuck's story upstages all of them. I also have a story of driving a large vehicle with just one eye. I won't tell that one either because it's not relevant to this discussion. Some of us are forced to work on our cars on the ground or in the grass. Asphalt pavement may also give way under a stand, especially on a hot and sunny day. And cinder blocks can crumble under the weight of a car. Whatever the conditions the car must be secure on whatever devices it's sitting. 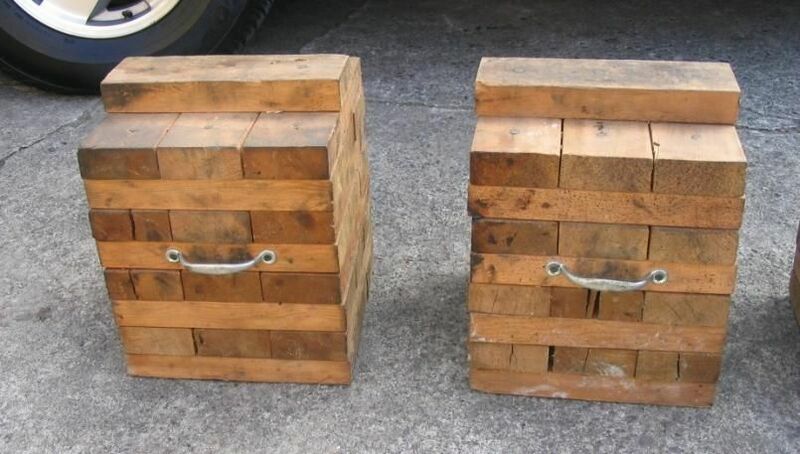 I personally prefer wooden blocks to any other device. Used railroad ties can be cut with a chain saw to appropriate lengths and are some of the best blocks for this purpose.